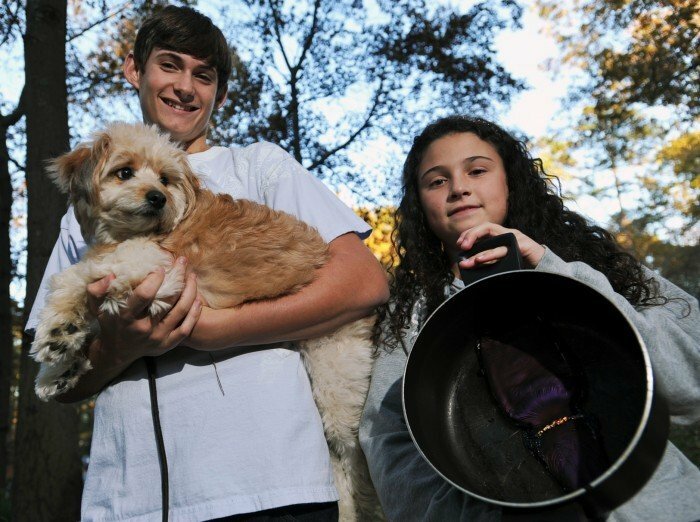 Ryan Leitz, 15, left, holds his dog, Bandit, while Maya Rose DeStefani, 9, holds a pot containing a melted hairbrush in Mays Landing. The DeStafanis were caring for Bandit over the weekend, when he alerted them to a burning hairbrush in a pot on their stove top. Bandit is credited with saving the family from the toxic smoke from the fire. Jennifer DeStefani’s lungs still hurt, half a week later. She’s OK with the pain. But ask her about the alternatives, and she tears up. “If it would have gone any longer ...” DeStefani says, leaving the thought unfinished, after the series of coincidences that left her family safe after a stove-top fire released toxic smoke in their home. DeStefani’s friend Marta DeGennaro attended an out-of-town wedding Saturday, so DeStefani watched her friend’s dog, a Pomeranian-poodle mix named Bandit. The DeStefanis already own some pets of their own — Gracie the cat and a Shar Pei named Stitch. Jennifer wasn’t sure how the animals would all get along, as Gracie and Stitch bicker with each other, so she decided to have Bandit stay in her bedroom, with the other animals elsewhere. DeStefani’s husband, Rich, a retired police officer, was sterilizing a plastic hairbrush on the stove for his wife. He filled a pot with water, added the brush, and there it sat. And sat. The family forgot about the pot and eventually went to bed. Water evaporated. Plastic burned. The family’s Mays Landing home filled with midnight-black, toxic smoke. At 3:30 a.m., the woman, man, their daughter, cat and dog slept, as smoke billowed through the house. Also sleeping — the home’s smoke detectors, purchased a day earlier, full of fresh batteries. Silent. So Bandit, all 15 pounds of him, jumped on DeStefani’s chest, barking again and again. Eventually, the barking and jumping woke DeStefani. “I smelled something strange and thought, ‘What the heck?’” she said. So she opened her bedroom door. She couldn’t see her hand just inches away. She woke her husband and daughter, Maya Rose, 9. The family opened the windows and got the pets outside. Stitch normally barks at everything, DeStefani said, but not that night. He was upstairs in a different bedroom when the fire started. Mays Landing Volunteer Fire Company Captain Larry Birch was the first responder on the scene. Birch said there was a moderate amount of smoke in the house by the time he arrived. Fire crews set up ventilation fans and cleared the smoke. Birch, a firefighter for 11 years, is used to fire calls. But rescues involving hero animals are not so common. “From the years I’ve been doing this, we’ve had two other reports of animals waking up the residents,” he said. As firefighters contained the smoke, emergency crews checked the family for smoke inhalation. While she declined treatment, Jennifer DeStefani’s lungs still hurt, half a week later. The acrid smoke smell lingers in the home. The family burned scented candles, trying unsuccessfully to mask the odor. After days of continuous clothes-washing, everything still smells like Sunday. The pot is ruined, filled with a purplish, greenish glittery mess, giving the family a lesson they will never forget. Bandit is back home with his owner. DeGennaro and her son, Ryan Leitz, 15, bought Bandit about two years ago. They’ll celebrate his birthday later this month. Bandit should expect chicken that day. And hugs and kisses from his grateful friends down the street. After the fire, Rich DeStefani returned the family’s brand new smoke detectors to the store. Only one went off during the fire, and that was after the fire department arrived. 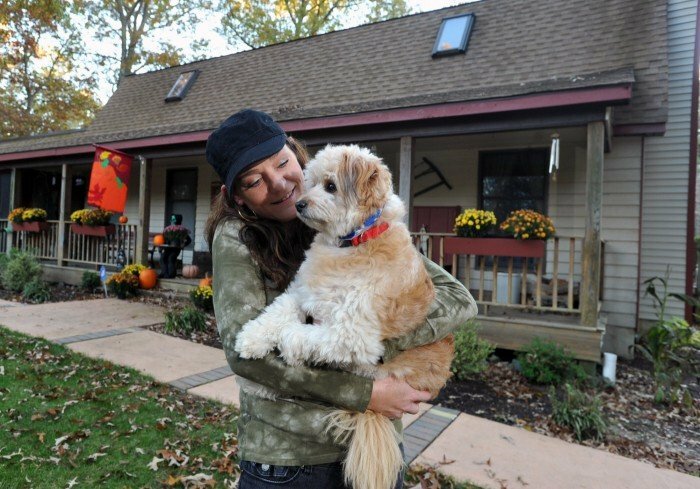 Luckily, Jennifer DeStefani had a 15-pound smoke detector jumping on her chest, barking. Local Content Producer/News Buzz Keough contributed to this report.